Skyland Farm made great memories and collected many impressive ribbons during the fourth week of the Winter Equestrian Festival circuit, held January 31-February 4 in Wellington Florida. Leslie Kopp and her jumpers starred in the Low Adult Amateur, 36 and Over, Jumpers this week, earning great ribbons. Most impressively, Leslie took the top two spots out of 26 competitors in Friday’s class, earning the win aboard El Cano and second place on Dolce Vita, respectively. Leslie returned on Sunday, and both of her mounts placed in the $1,500 Low Adult Amateur Jumper Classic, placing sixth and seventh in a competitive class to culminate a wonderful week. Emma Pell continued her excellent performances in the pony ring aboard a string of sale ponies she’s showing this winter. Emma guided her own Cedilo to the Medium Green Pony Hunter championship, and the fancy chestnut is now qualified for this summer’s US Pony Finals. Emma and Thora Pollak’s Rebel Yell earned excellent ribbons in every Medium Pony Hunter over fences class (with the reserve under saddle). Judy Hahn’s Twizzler had a good showing in the Small Green Pony Hunter section and won her last jumping class on Sunday with a lovely performance. At Skyland Farm we are committed to helping you reach your goals, whether you want to win at the country's best shows or simply improve your horsemanship and riding skills. Skyland Farm is a full-service equestrian training center dedicated to the best of care and producing top hunters, jumpers and ponies. We have programs suited for all levels from short and long stirrup through to the grand prix level. 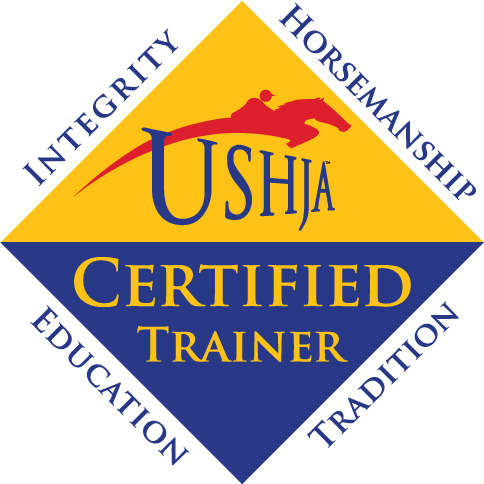 Trainer Denice DeRisio Perry is a United States Hunter Jumper Association Level 1 Certified Trainer and a United States Equestrian Federation R-rated judge in hunters, jumpers and equitation.